Not all preschools are the same. Selecting the best preschool for your child is a big decision — one that requires consideration of many factors. One of the most important factors to consider is the school offers the kind of preschool environment that will prepare your child for elementary school and beyond. Here at Fairfax Christ Lutheran preschool, our dedicated teachers and staff will help you understand just why we may be the best preschool for your child. Below is a description of the advantages Fairfax Christ Lutheran Preschool offers over other public and private preschools. The preschool educational philosophy applied by Fairfax Christ Lutheran is through social development, with an emphasis on play-based learning. We believe children learn through play in a safe and nurturing environment. 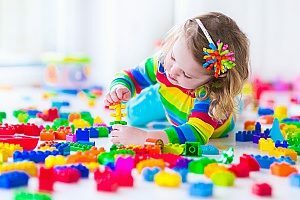 The play-based preschool philosophy is designed to enrich your child holistically, including social, emotional, physical, cognitive, and creative development. Also, being affiliated with the church means your child will learn Christian values. Through a play-based program that attends to your child’s total development, we strive to foster a sense of community that will sustain and enrich the children throughout their lives. Our curriculum introduces basic academic skills using activity-based experiences. For example, the children will begin learning the alphabet and begin numbers and counting, as well as spend time with arts and music activities. We have discussed our curriculum with teachers and administrators from Fairfax County Public Schools, and we are pleased to report that the children who have attended Fairfax Christ Lutheran preschool are well grounded and prepared to move on. They are socially ready for kindergarten and better prepared to learn the academics once in elementary school. The elementary school staff wants the preschool to prepare the children socially and let the elementary school take the children forward academically. All curriculums at Fairfax Christ Lutheran Preschool are designed to help children believe that they can become a doer, a leader, and a nurturer. We work to encourage children to develop lifelong Christian values and to be sensitive to each other, their environment, and the world at large. We believe that preschool is time to learn social and emotional skills so your child is well-equipped to move forward academically. The teachers are happy with the school, its philosophy, and its environment. Our teachers see children as unique individuals and respond to their individual needs. Many parents want to be involved in their child’s preschool activities. We request parents help in their child’s classroom on a rotating basis to support the teacher during the class session. The parent helper provides assistance by setting out craft supplies, helping the students wash hands, guiding the children during clean up time and other like activities. By being in the classroom, the parent observes the teacher and what is going on in the classroom, gets to know the teacher and the other children well. Parents love seeing their children interacting with playmates and they are confident that their children are in a loving, caring environment. The preschool classes are offered at different dates and times to accommodate the developmental ages of the children. You can determine which class schedule is most suitable for your child’s needs and your own schedule. Also, the preschool generally follows the same general schedule for holidays as the Fairfax County public schools. We offer before school care, lunch bunch, enrichment classes, and after school care. We are in the process of adding before and after school programs for our preschoolers beginning at 8:30 a.m. until 3 p.m.
At Fairfax Christ Lutheran Preschool, the teachers and staff know that selecting the right preschool is an important first step in the development of your child. We hope you will contact us to schedule a tour of our beautiful Northern Virginia preschool grounds and meet their loving and caring teachers and staff members. They are happy to talk to you and can provide you with contact information of many satisfied parents of their students.